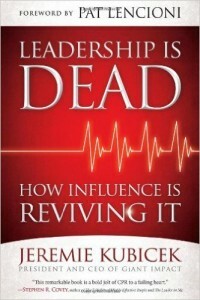 I have to admit I nearly passed on reading Leadership Is Dead: How Influence is Reviving It by Jeremie Kubicek. The assertion in the title “Leadership Is Dead” cuts against the grain of everything I believe and know from my 28 years of leadership experience. Upon advice of a friend, I read it anyway and I’m glad I did…rest assured, the author doesn’t really believe leadership is dead…just the perception that if you’re in charge it means you’re leading. Kubicek uses this book to express in his own words an idea that others have written about for some time now…the difference between authority and power…where authority is bestowed from the top down through something legalistic where power is earned from the bottom up based upon something moralistic called respect. The discussion about relationships is spot-on and instructive. The narrative is good reading as it uses a philosophical “chicken and egg” type argument to demonstrate how a relationship precedes a customer or influence with the people in your organization. Additionally, the discussion of time is good reading as it explores the risk of short term gain to make numbers as opposed to a more patient approach to investing in a relationship that will bear fruit for the long haul. Overall this is a quick and light read that will help you find your own words on the essence of leadership…which is not dead. I gave the book a 3 out of 5 stars rating in my review for Amazon because of the title but it’s worth your while to read. It’s also worth remembering that doers are readers. The more we read and increase our ability to think, we also increase our capacity for achievement. It’s what a Critical Doer would…do! In my humble opinion, “judging based on appearances” is nearly always a mistake. There is a whole body of thought out there on intentionally appearing the opposite of the truth. When weak; appear strong. When strong; appear weak. Point being there is a PURPOSE in deception! Your review reveals exactly what really needs to happen. Don’t get misled by the words. Think hard & critically to ferret out the real message. Understand the message & the context in which it was delivered. On a second point — again in my own opinion — the world has too many followers for leadership to be dead. And too many in charge only “think” they are leading, when all they are really doing is following a rule set by a higher level of the organization!